Tampa, FL. 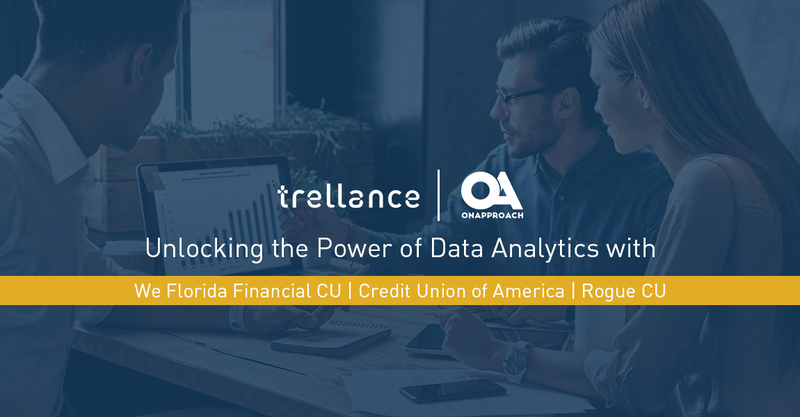 (February 27) – Trellance and OnApproach are excited to announce that three credit unions will be joining the CU Analytics Ecosystem, powered by OnApproach. These credit unions represent the first institutions to select the collaborative OnApproach M360 data platform since Trellance’s acquisition of OnApproach on February 8, 2019. Despite utilizing different core processing systems, these credit unions can now collaborate with the quickly growing list of credit unions within the CU Analytics Ecosystem for enhanced analytics. This is made possible by the standardized and core-agnostic data platform, OnApproach M360 Enterprise. By leveraging OnApproach M360’s common data model, credit unions can work together to efficiently develop and share analytics models, resulting in improved member experience, data-driven organizational decision-making, and increased profitability. With over 30 years of experience in the payments industry and partnering with credit unions, Trellance continues to work towards ensuring that all those served by financial service cooperatives have access to exceptional data-driven products and services, while maintaining our commitment to foster growth. Being processor-neutral allows us to offer unbiased guidance and set us apart from our competitors. OnApproach is a CUSO dedicated to credit union success through a collaborative analytics ecosystem. By providing a secure and frictionless data experience, OnApproach empowers credit unions to take full control of their own data and their own futures. We exist to serve the credit union movement with technology and expertise required for the digital transformation of the industry business model. OnApproach’s collaborative ecosystem enables communities of users, data scientists, and application developers focused on analytics innovation.